Help us reach our goal today of $5,000! 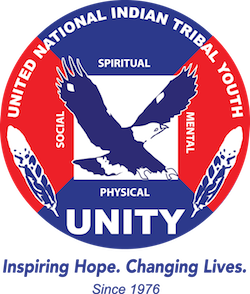 Will you help us provide scholarships for deserving Native youth to attend the 2019 National UNITY Conference? 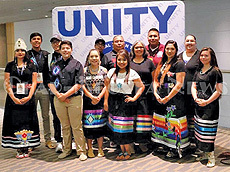 Each year, UNITY is inundated with requests for financial assistance from deserving Native youth to attend the annual National UNITY Conference. These youth are looking for the opportunity to network, learn, and build on their inherent leadership skills. They are our future. This year, on this #GivingTuesday, UNITY will collect dollars to create a scholarship fund to help youth who otherwise do not have the financial means to attend the 2019 National UNITY Conference taking place July 4 – 8 in Orlando, Florida. CLICK HERE TO SHOW YOUR SUPPORT! THANK YOU! The INSPIRE program offers full scholarships to Native American, Alaska Native, and Native Hawaiian high school students to student applied American politics as part of a three (3) week summer program at George Washington University. Funded by a generous grant from AT&T, the scholarship includes tuition for one course in Native Politics and the American Political System, on-campus room and board, round-trip air travel, and all required textbooks. The deadline for the application is March 1, 2018. Application to Friday, June 16, 2017. In honor of the life of Golda Cook (1913 – 2005) and her on-going support of UNITY, especially in the organization’s early years, Golda’s friends, family, and UNITY trustees have made contributions to establish the Golda Cook Memorial Fund. UNITY will award two individuals (one young woman and one young man) $1,000 each, during the 2016 National UNITY Conference. Application deadline is Tuesday, May 31, 2016. Click here for application and criteria.